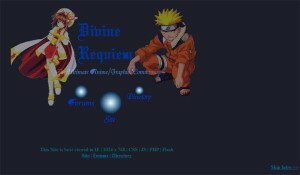 Divine Requiem was an anime/graphics community that I created back in high school. It extended from an even older anime resource site called Japanime that I had created before. The goal of the website was to share anime, graphics, avatars, layouts, wallpapers, etc with other people. The site had an integrated forum and once boasted over 1000 members. Unfortunately the site had to be shut down pending my transition to university life. 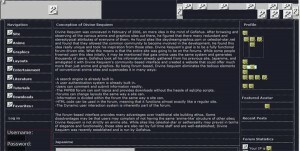 This website was meant to be interactive, and as a community meant to propagate the spreading of resources to everyone. Coppermine Gallery was used as a way of having users upload, download and exchange information while PHPBB was a valuable tool for creating forums. Furthermore, PHP-Nuke was an ideal content management system that also links very well with phpbb.